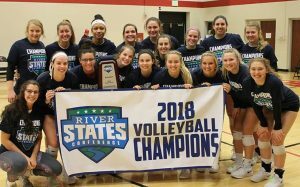 KOKOMO, Ind – IU Kokomo claimed the River States Conference Volleyball Championship with Saturday’s 3-0 win over Brescia (Ky.) University in the final match. The Cougars extended their winning streak to 25 matches in a row and improved to 19-0 this year versus RSC competition. IU Kokomo had already earned a bid to the NAIA National Championship after going 16-0 RSC as conference regular-season champs. The Cougars added three wins on top of that this weekend on their home court for the tournament title. IU Kokomo will take a record of 34-4 into the NAIA National Championship, which begins Nov. 17. Brescia (23-17) will also represent the conference at the national tournament. The Bearcats earned their bid as RSC runner-up because IU Kokomo won the regular-season and tournament title. Brescia won the final two sets to beat Asbury (Ky.) University, 3-2, in Saturday’s semifinals to earn punch their ticket to nationals. In the first match of the day, the IU Kokomo took on IU Southeast in the semifinal round. Going the full five sets in a back and forth match, IU Kokomo was able to rally for a victory (23-25,25-21,25-16,19-25,15-11) after dropping the first and fourth set. After a short break, IU Kokomo returned to action to sweep Brescia in the final match of the RSC tournament (25-21,25-21,25-22) to claim the RSC Championship. Four Cougars hit over .350 on the match, including McKenna Lundy accumulating a double-double after hitting .407 with 12 kills and 14 digs. Leading the team in kills, Nyssa Baker amassed 14 kills with a .579 clip. Erinn Adam hit .389 on the day while Molly Ottersbach had a .357 hitting percent. Defensively, Macee Rudy and Kristi Elson picked up 16 digs each, to pair with Lundy’s 14. As a team, IU Kokomo collected 11 blocks, led by Erinn Adam and Nyssa Baker.